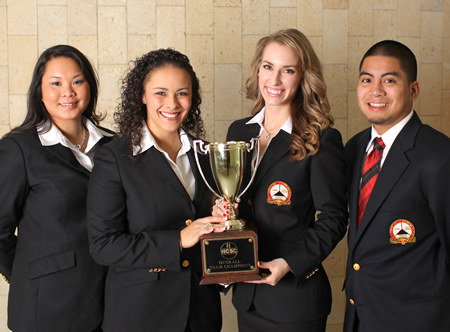 Marketing students Taylor Herbert and Rebekah Elliott, center left and center right, competed in the National Collegiate Sales Competition and took home the first place trophy, with Jozette Bionat and Adrian Sese serving as team alternates. A team of four students from the Program for Excellence in Selling at the University of Houston C. T. Bauer College of Business placed first in the U.S. recently at the National Collegiate Sales Competition held at Kennesaw State University. Held in early March, this year’s competition boasted teams from more than 60 of the top graduate and undergraduate sales programs in the nation, with the UH Bauer team taking the top spot. The team consisted of competitors Rebekah Elliott and Taylor Herbert and team alternates Jozette Bionat and Adrian Sese, all marketing students in Bauer’s Program for Excellence in Selling. The competition required students to prepare a sales presentation for a mock meeting with a buyer lasting 20 minutes, as they were recorded and graded by a judging panel on criteria such as needs identification, approach and communication skills. This year, competitors were required to sell NetSuite CRM, a leading vendor of cloud computing business management software suites. The skills taught in the Program for Excellence in selling gave the UH Bauer team an edge, Elliott said. PES Clinical Professor Amy Vandaveer, who teaches Professional Selling and the career preparatory lab for the program, has coached the NCSC teams from Bauer for the past three years. The drive and ambition of this year’s team was there from the start, she said. The live selling experience students gain through the PES curriculum was integral to the team’s success, Vandaveer said, giving them the ability to think on their feet and pull from real world experience. Click here to watch a video about the #1 PES team! Marketing Ph.D. candidate Willy Bolander, who teaches Advanced Professional Selling and the introductory Professional Selling course, also coached the team. “The fact that UH was the only participating university to have both competitors reach the semifinals speaks volumes not only to the hard work of the individual students, but also to the effort of their teammates and the overall quality of education provided by the Program for Excellence in Selling,” he said. The students filmed their practice sessions for critiques and spent time working with the NCSC team from 2010, who were semi-finalists in the competition.